The new ILM-4 conductivity sensor from Anderson-Negele is an excellent example of how well-coordinated CIP cleaning automation can maximize product reliability while minimizing resources. Effective CIP cleaning relies on correct metering of the cleaning agent. The right concentration is produced in the balance tank by mixing. While low concentrations can lead to inadequate cleaning results, concentrations that are above the required level drive up costs. The inductivity sensors of the ILM series, with their excellent reproducibility, are perfect for controlling cleaning agent concentrations and in this way help reduce the quantities of chemicals used. During cleaning, the exact concentration of cleaning agent combined with the factors of time and temperature are decisive in running a safe process. On account of their ability to provide reliable and precise measurements, conductivity sensors of the ILM series are already established in the field and an integral part of many CIP plants.In a resource saving process, the chemicals are recovered for reuse by means of phase separation. Cleaning solutions flowing back out of the plant are identified based on their specific conductivity and are fed back into the appropriate stack tanks (base, acid, water) via downstream valves. A decisive factor in achieving low loss levels (apart from high reproducibility) is a temperature compensation that responds rapidly to the different medium temperatures in the process. 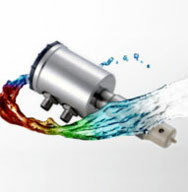 With its optimized temperature response time, the ILM-4 conductivity sensor is excellent at differentiating between wash and rinse cycles and is thus capable of generating cost savings by reducing safety margins. With the ILM-4, Anderson-Negele is introducing an advancement of its tried-and tested ILM series that is even more powerful and provides still greater comfort and flexibility. The sensor is compatible with the predecessor models and easy to integrate in the process on account of its compact housing design. With a temperature response time that is 4 times faster, the ILM-4 sets new standards and is ideally suited for phase separation in CIP plants. The sensor can be used continuously at process temperatures of -10 °C to 130 °C (and at peaks of up to 150 °C for one hour).All parameter adjustments can be made on the device display or on a PC and can be conveniently transferred to additional devices using the software. The measurement ranges can be freely adjusted, and the calibration function permits calibration by the plant operator on-site.The modular device platform from Anderson-Negele gives the plant operator maximum flexibility in the configuration of the sensor. The standardized components can be replaced directly on-site, which saves maintenance costs and time.